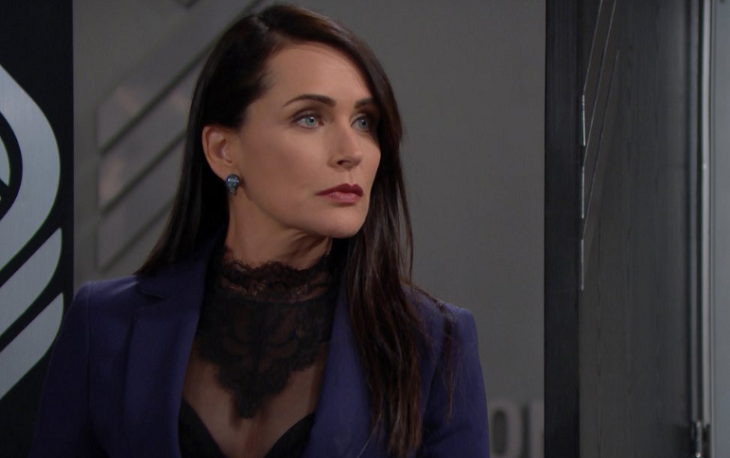 “The Bold and the Beautiful” (BB) recap for Monday, April 15, 2019 reveals that over at Forrester Creations, Hope Logan Spencer (Annika Noelle) assumes Flo Fulton (Katrina Bowden) was trying to tell her she was her cousin. Wyatt Spencer (Darin Brooks) apologizes for ruining the moment if Flo wanted to tell Hope herself. Shauna Fulton (Denise Richards) interjects with how sorry she is that she didn’t know her father was the sweet Storm Logan (William DeVry), now she’ll never meet him. Hope wants to tell her mother and aunts, and asks Flo to come meet the rest of her family. At Spencer Publications, B&B’s Bill Spencer (Don Diamont) and Justin Barber (Aaron D. Spears) discuss the near-miss with Flo Fulton’s paternity. Justin laughs that Bill wouldn’t know what to do with a daughter. A temp, Georgina, announces a Mrs. Forrester, and Quinn Forrester (Rena Sofer) sweeps in. Justin exits and Bill tells Quinn he is not interested in rehashing the paternity drama. Quinn still cannot believe he was with Shauna Fulton. Bill chortles that she’s gorgeous but assures Quinn it was only one time. He says there’s no reason to be jealous. Quinn sputters, “What?” Quinn’s not jealous and is relieved for Wyatt Spencer’s sake that Bill wasn’t the father. Talk turns to Flo and Wyatt. Quinn says he’s gone with her to tell the Logans, who had better welcome her into the family. She next reveals that Flo is Phoebe’s birth mother. At B&B’s Brooke Logan Forrester’s (Katherine Kelly Lang) place, the Logan sisters are surprised to see Hope arriving with Flo, Shauna and Wyatt in tow. Hope introduces Shauna, then Flo, who is about to change their lives. Katie Logan (Heather Tom) wonders if this involves Wyatt, who explains he and Flo used to date and he urged her to find her father. Brooke asks, “We know the father?” Wyatt confirms it. Shauna mentions Bill and Katie groans, “Again?” Wyatt says Bill isn’t Flo’s father, then reveals the DNA results showing Storm. Hope verifies, “Flo is a Logan!” They question Shauna, who explains Storm visited Vegas and that she never knew he was her daughter’s father. Donna Logan (Jennifer Gareis) feels it’s a lot to process; it hurts to think about the different choices Storm might have made had he known. She’s certain he would have given Flo everything so they will have to do that for him. Brooke says he’d have loved Flo very much. The sisters can see Flo’s resemblance to their brother. Each sister welcomes her to the family with a hug. Katie is designated to relay the story of how Storm killed himself to save her life, then invites Flo to feel her father’s heartbeat. B&B’s Flo places her hand on Katie’s chest, then thanks them all. Hope declares she’s one of them now and thanks Flo for what she did for Steffy Forrester Spencer (Jacqueline Wood). Flo doesn’t want her to bring it up, but Hope couldn’t be happier to learn Phoebe is family. Shauna is stunned to hear her refer to Flo’s daughter – she’s never been pregnant. Hope turns to Flo, “Is Steffy’s daughter…? Oh my gosh.” And that’s a wrap. Don’t forget to check often with Soap Opera Spy for all your Soap needs!